The Shoemaker and their friends are off on another camping adventure, this time to a campground near one of Donna Nowak's many childhood homes. They're all set for an enjoyable trip down memory lane, and Donna is connecting with old friends, when she discovers to her horror that her abusive ex-foster father is the campground's handyman. The next day, he turns up dead. And while there are a lot of people who might have had a score to settle with him, Donna is the one the local sheriff finds most convenient. Frannie is trying hard to follow Larry's advice about not interfering and not putting herself at risk, but even while she's following that advice, she can't help noticing things. And when she notices them, she asks questions. 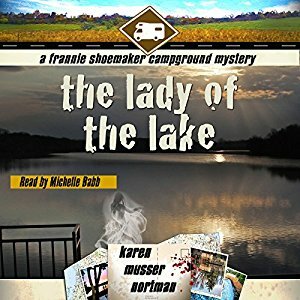 Among their fellow campers are a writer of romantic mysteries and "goddess worshiper" who sells hand-carved wooden knives, and these ladies both have their own secrets they're protecting--and possible motives for murder. We learn a lot about the often abrasive Donna's background and motivations in this story, and I love it that the other characters, especially Frannie, continue to grow and develop--and even learn from past mistakes! A very enjoyable light mystery.